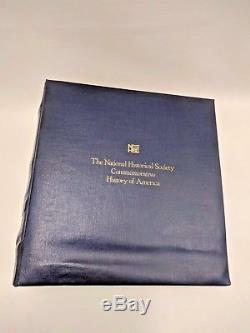 National Historical Society History of America Commemorative Medallic Cachets set (Franklin Mint, 1978) Volume I, 32 pieces. 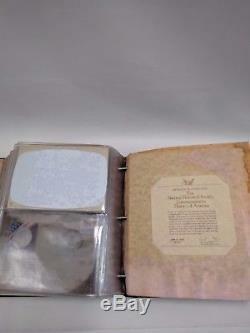 This is an incomplete set with only 32 medallions of the original 50 medallions found in Volume 1. Volume 2 is not included. 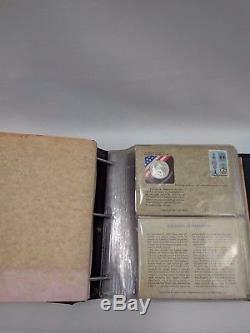 Catalog book has signs of wear including scuffs, scrapes, wrinkling and other signs of age. Inside cover page and back page show signs of age and extensive stains. Certificate of Authenticity appears to be in good shape. 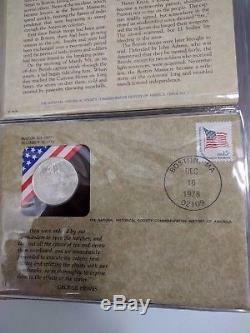 All medallic cachets (cards and stamps) are in plastic sheet holders, some have wrinkles in the paper or discoloration of the cachet card. Stamps and postmarks are present and legible. The 32 sterling silver medallions are in proof condition and embedded in the cards. Please be sure to look over the photos closely, use the zoom, read the description carefully and ask questions before purchasing. 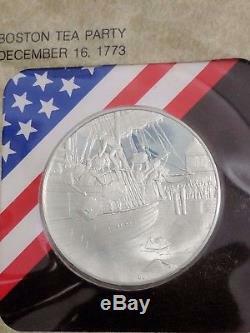 The National Historical Society, Commemorative History of America, Sterling Silver Limited Edition struck at the Franklin Mint. 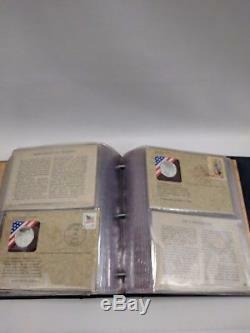 This is one album for sale containing 32 of the original 50 sterling silver medals and stamps from the Franklin Mint. Each solid sterling medal is approximately 32mm and weighs 1/2 oz. Each medal is stamped on the edge with sterling and hallmarks. 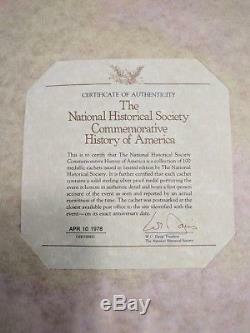 Certificate of Authenticity has the following text, The National Historical Society Commemorative History of America. 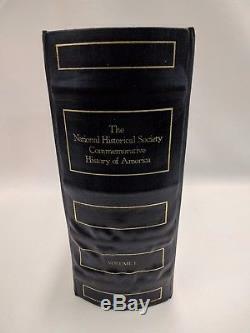 This is to certify that the National Historical Society Commemorative History of America is a collection of 100 medallic cachets issued in limited edition by The National Historical Society. 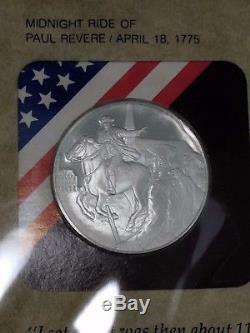 It is further certified that each cachet contains a solid sterling silver proof medal portraying the event it honors in authentic detail and bears a first-person account of the event as seen and reported by an actual eyewitness of the time. 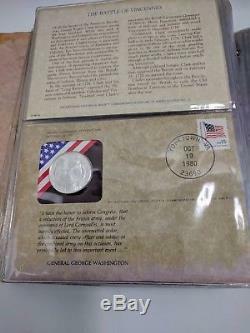 The cachet was postmarked at the closest available post office to the site identified with the event---on its exact anniversary date. 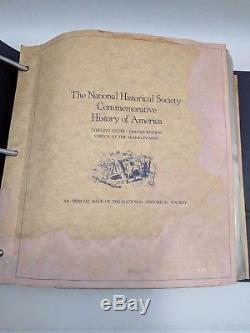 April 10, 1978 , signed by W.
Davis, President, The National Historical Society. The full list of 32 Medallic cachets included in this Volume I are as follows. Columbus discovers the New World. Joliet and Marquette explore the Mississippi. Penn Guarantees freedom to Pennsylvania. Patrick Henrys Speech of Defiance. Midnight Ride of Paul Revere. Washington becomes the national capital. Whitney invents the Cotton Gin. Writing of the Stargled Banner. Opening of the Erie Canal. See photos for a more detailed description, and please don't forget to scroll down and read below for this item's Terms and Conditions. Or when checking out through the. To locations outside of the United States for most of my listings. However, some vintage items or antiquities may have had origins that vary. I believe that we can resolve any issue that may arise in a positive manner. Your total satisfaction is my top priority and ultimate goal. If the product is damaged, or defective, you may return it within 30 days. If your return is the result of my error damaged, defective, incorrect item, etc. 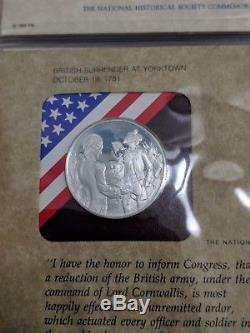 The item "Franklin Mint History of America 32 pc. Sterling Silver Proof Medallic Cachets" is in sale since Saturday, July 14, 2018. This item is in the category "Coins & Paper Money\Exonumia\Medals". The seller is "squaretale" and is located in Naples, Maine. This item can be shipped to United States, Canada, United Kingdom, Denmark, Romania, Slovakia, Bulgaria, Czech republic, Finland, Hungary, Latvia, Lithuania, Malta, Estonia, Australia, Greece, Portugal, Cyprus, Slovenia, Japan, China, Sweden, South Korea, Indonesia, Taiwan, South africa, Thailand, Belgium, France, Hong Kong, Ireland, Netherlands, Poland, Spain, Italy, Germany, Austria, Israel, Mexico, New Zealand, Philippines, Singapore, Switzerland, Norway, Saudi arabia, Ukraine, United arab emirates, Qatar, Kuwait, Bahrain, Croatia, Malaysia, Brazil, Chile, Colombia, Costa rica, Panama, Trinidad and tobago, Guatemala, Honduras, Jamaica.